The young heroes of the town of Kassen are ready for their coming-of-age ceremony, an old tradition in which they retrieve a piece of the eternal flame burning in the tomb of the town's founder. Yet when they arrive there, they find only the corpses of their fellow townsfolk, dead bandits, and mysterious animated skeletons. The novice heroes must brave the traps and perils of the Crypt of the Everflame, discover the source of the corruption that has awakened an ancient evil, and defeat a menace that seeks vengeance against Kassen and its people. 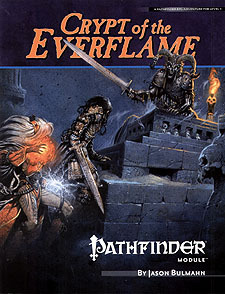 Crypt of the Everflame is a dungeon adventure for 1st-level characters, written for the Pathfinder Roleplaying Game and compatible with the 3.5 edition of the world's oldest RPG. The adventure map uses the same layout as the 2009 edition of Paizo's Flip-Mat: Dungeon. This adventure is set in the forested land of Nirmathas in the Pathfinder Chronicles campaign setting, but can easily be set in any game world. It can be used on its own or combined with its sequel, Masks of the Living God, to create an even greater campaign arc.